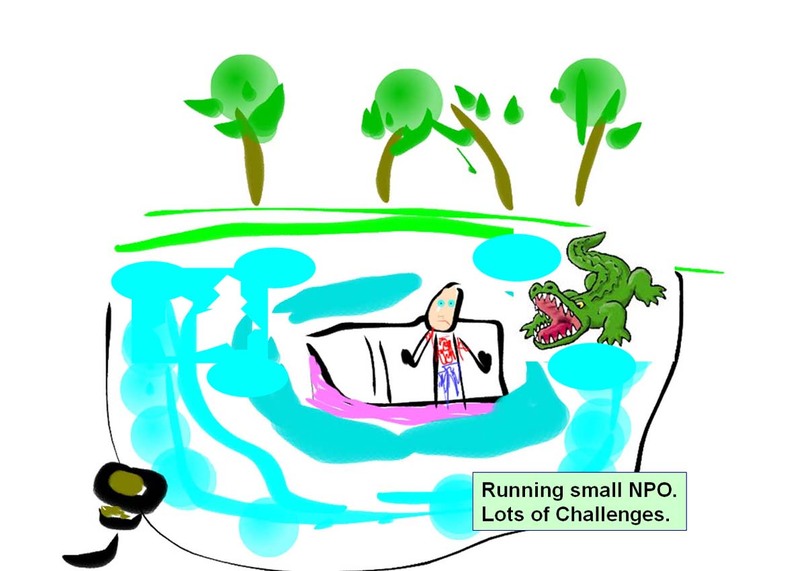 Social Innovation 3.0 - Who does the inviting? I found this video through one of my Linkedin Groups. It shares many ideas that resonate with me. I hope you'll take a look. In this video one example was the STRIVE Partnership in Cincinnati in which the President of the local university was a major force for bringing business, educators and philanthropists to the table. In other articles I've read it seems that "those with the money" are the ones most effective in drawing groups together for common purpose. I think that misses one of the major strengths of the Internet. Anyone with a good idea should be able to share it and invite others to view it. If the idea is good enough it should become a magnet that attracts support from many places. I'm not sure it's yet working this way except in rare cases. With this comment, Vance Stevens of the Webheads group announced that the Podcast from the August 26 discussion on volunteer recruitment is now available for others to listen. Dan Bassill does some remarkable work bringing his past business experience and present passion for improving the lives of disadvantaged kids in Chicago through his tutor mentor programs, and the mechanisms he sets up for that are interesting, instructive, and relevant to communities of practice which rely on the cognitive surplus of like-minded volunteers. I received an email this morning from Tess Pajaron, who has been reading the articles I post. Thank you Tess! She sent me the infographic posted below. Through the combination of data, information technology, the internet and financial interests big changes are coming to how and where learning is provided and supported. 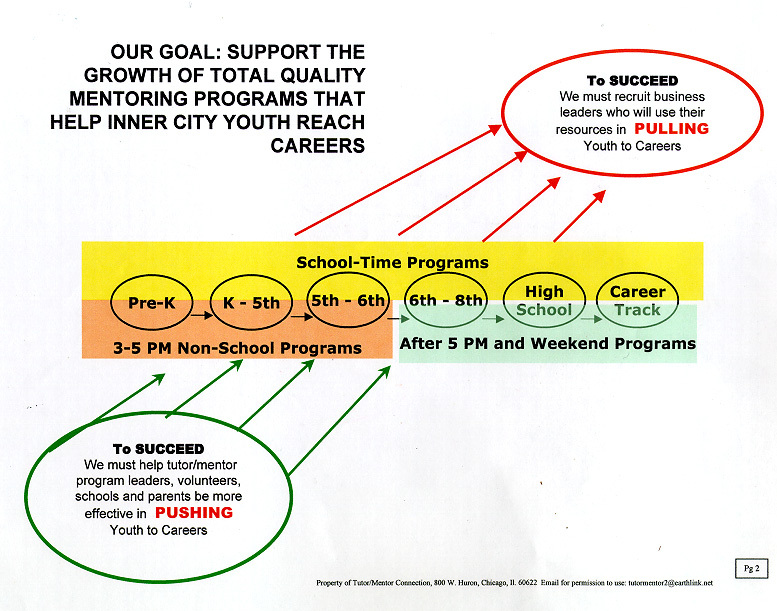 This is a graphic I created in the 1990s to illustrate a need for many leaders to be drawing people from their own influence networks into learning circles which use information like these infographics and recorded sessions to build strategies that reach youth in high poverty areas with all of the learning opportunities that keep expanding for kids who live beyond such neighborhoods. It would be great to see students and volunteers creating infographics to describe the process that might make this happen. At this blog you can see work interns have been doing working with me in Chicago. If you're interested in joining this work please introduce yourself. I led an informal discussion about volunteer recruitment on Sunday, Aug. 26 in the Webheads Elluminate forum. The recording can be seen here. See description of this discussion on the Learning2Gether site. Unfortunately, only two other people joined me in the discussion. One was Vance Stevens, who has led the Webheads network's growth since the early 1990s and who is located in Abu Dhabi. Vance and I first connected in 2004 when the Webheads group co-sponsord a tutor/mentor on-line conference while I was hosting a place-based conference in Chicago. The second was John Hibbs, who has been hosting a Global Learn day since the late 1990s. Here's an introduction from John in the 2004 event. Here's some photos from Global Learn Day VI which I participated in from Chicago. John is now focusing on Coursera, which is a new platform for massive on-line learning that is partnering with "the top universities in the world to offer courses online for anyone to take, for free". Since we did not have any tutor/mentor program leaders in the discussion to give feedback on their volunteer recruiting practices we used the time to talk about ways on-line networks like Webheads or Coursera could incorporate questions like this into their own efforts, reaching thousands more potential participants than the few I'm able to bring to the conferences in Chicago or gather in my social networking spaces. I encourage you to listen in to the one hour recording. Follow the text chat box to find questions and ideas that are being shared while I was pushing out information through the Elluminate screen. If these topics interest you, join the Tutor/Mentor Connection forum on Ning to expand your ideas of where, why volunteer-based tutor/mentor programs are needed and how people in all sectors of society can help them grow. If you've time, this video will inspire you to expand your vision of what's possible. 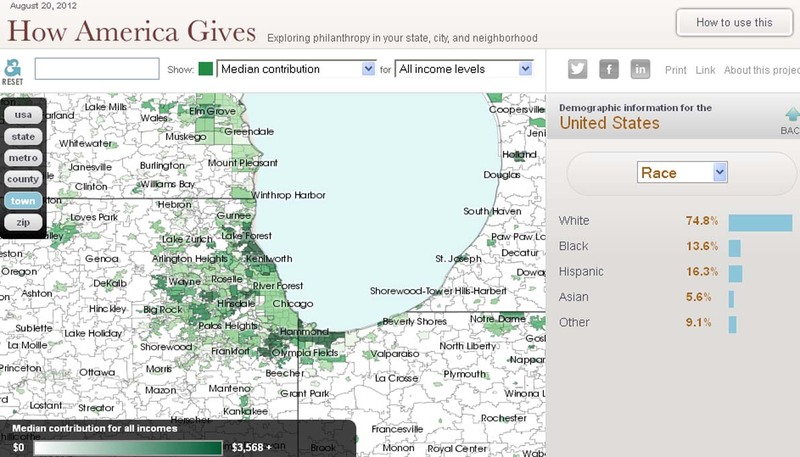 Through my Twitter feed I was introduced to the Chronicle of Philanthropy's special section on How America Gives. The graphic below shows the home page of this innovative site. There is a wealth of data on this site that can be used to help volunteer-based tutoring, mentoring and similar birth-to-work programs grow, if we can find people who will make time to dig through the data and figure a way to use it to educate and motivate donors. 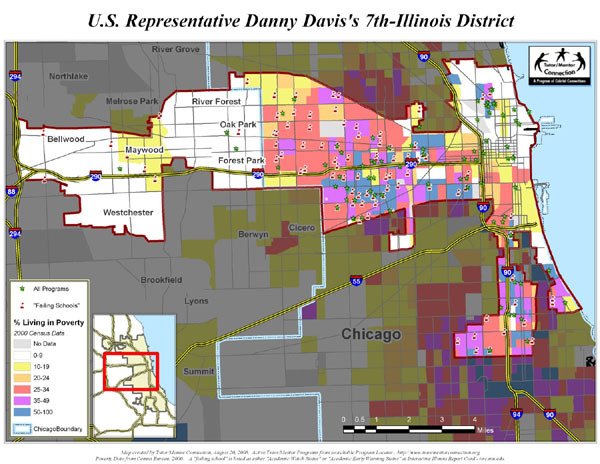 This image is one showing the Chicago area. It's an example of the powerful interactive mapping capacity of the site and shows how people can create their own maps, then export them to photoshop and create JPG images that can be inserted into blog articles or other communications. In this Rest of the Story article and this "How to use Tutor/Mentor Program Locator article I've been sharing ideas that student and volunteer writers, journalists and advocates could use to help build on-going support for volunteer-based tutoring and/or mentoring programs helping young people move through school and into jobs and careers. Making sense of the information is only the first challenge. Communicating these ideas on an on-going basis so that busy people in business, philanthropy, politics, etc. spend time reading, reflecting and integrating the understanding into their own commitment and actions is a much more difficult challenge. We have a short term problem solving mentality and want to simplify complex problems into five-minute elevator speeches. That only works if the person we're talking to has a deep understanding of the problem and can intuitively understand the proposed solutions. That does not happen without many hours of reading, reflection and experience. Sharing this information and increasing the number of people who use it is as difficult as pushing a boulder up a mountain, especially if you're doing it by yourself. Finding others who share the same vision, purpose and goals and who will share the work is what my daily goal is in writing these articles. If you'd like to help, or if you know others who already are doing this same work, please connect with me. In an article I wrote in December 2011 I talked about how non profits become good at what they do, then great, and how they need to stay great for many years to have an impact on young people and communities. In this part of the Links Library I point to articles that illustrate challenges non profits have in growing from good to great. 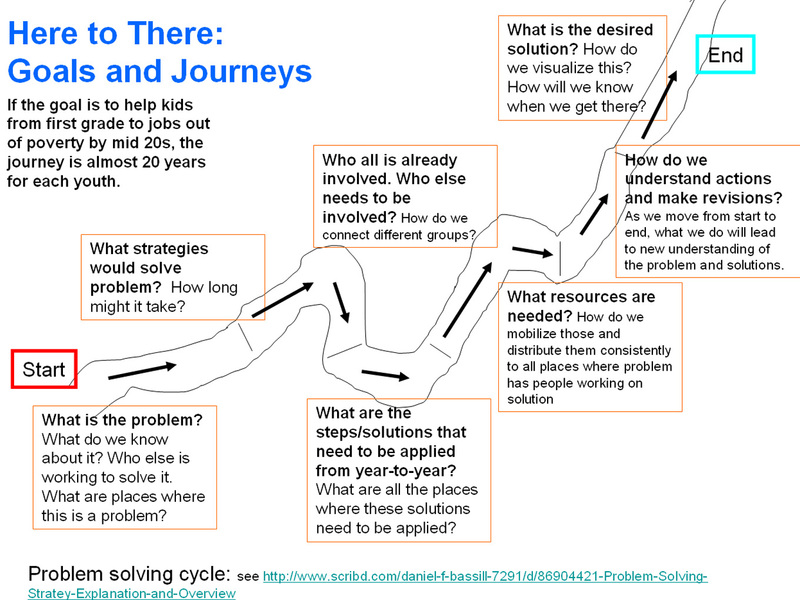 I've created a number of graphics to illustrate this thinking which I hope are used in leadership circles throughout the country to engage others in thinking of what actions they need to take on an on-going basis to help all of the youth serving organizations in their community become world class at what they do to help kids become thriving adults. In my own efforts I've been trying to help constantly-improving non-school tutor/mentor programs grow in high poverty areas of Chicago. I use maps like this one to show where poverty is concentrated which I feel is where resources need to focus in order for a wide range or mentor-rich youth programs to form. I've never had more than $150,000 a year to do this work which is far too few dollars to collect all of the information needed to support decisions that need to be made in many leadership sectors. Nor have I had money for advertising, training and promotions that would draw volunteers and donors to this information on a consistent basis, and at key times of the year, such as now when school is starting and all tutor/mentor programs are looking for volunteers. For the past year I've had almost not money to support this effort. 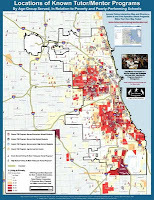 * What is the "combat readiness" of each of the organizations working with youth in the Chicago region? * What is their financial health? Do they have a consistent flow of resources to carry them through this year and into next year and beyond? * What is their leadership strategy? Do they have experienced people devekioubg abd leading the organization's strategies? * Who do they want to emulate? When you look at the web site (if they have one) of each youth organization do they post a list of 4-6 other youth organizations that they feel are "best in class" and that they are trying to emulate? * What is their mission? 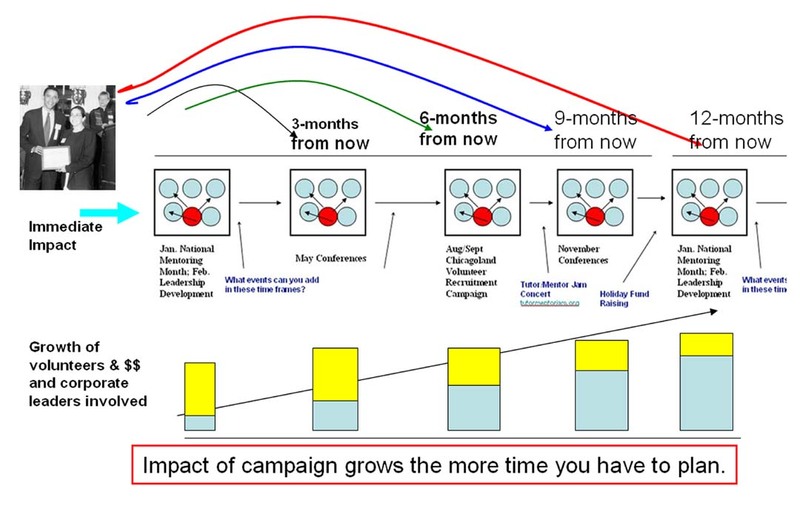 Where would the organization's strategies fit on this graphic? How do they compare to others who do this work? 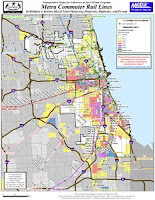 Is anyone doing the market research needed to understand how well youth organizations in the Chicago region (or in other cities) are prepared to help youth move through school and into adult lives? I'm not looking for "generalizations" or "aggregations" of information. We should be able to put icons on maps showing the different readiness of each organization shown on the map. And leaders should be able to use this information in resource-mobilization effort that help strengthen existing organizations and fill in voids with new organizations where more are needed. Is anyone interested in putting their name on a Think Tank or Research Institute focused on collecting and sharing this information? Share the links in the comment section if you can answer these questions. This is one of several videos I created a year ago to outline the strategies of the Tutor/Mentor Connection. There are more than 2000 links in the Library I've been building for the past 20 years. 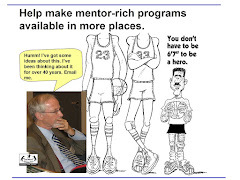 I have used this information personally to build and lead volunteer-based tutor/mentor programs since 1975. I've been sharing this information for over 20 years to help others build and sustain programs with similar goals in many different places. No one can read this in a short time. However, if learning is extended over many years this information can become a foundation of ideas that support actions of leaders from many sectors, intended to help high poverty neighborhoods have a wide range of youth and family supports that lead more young people through school and into adult jobs and careers. I'm now supporting the Tutor/Mentor Connection through the Tutor/Mentor Institute, LLC. I've posted a library of essays showing how this information might be used and encourage you to view these along with the videos. I hope you'll budget time each week or month to read and reflect on some of this information. I also invite you to become a financial supporter, partner or investor to help me build and sustain this platform. Read more. Here's a blog article from Chicago Magazine that offers additional perspective about Chicago's Murder Problem. What I'm looking for are efforts by traditional and nontraditional media to increase the number of people reading these articles then working to build solutions and make the available in every neighborhood where poverty and segregation contribute to the problem. This is one article I share at Scribd.com showing the goal of "growing the network". I'd like to find a place on Facebook or Linked in where media, journalists, advertisers, etc. who area already writing about the problems of poverty would share ideas for building and sustaining a growing network of people who will volunteer time, talent and dollars to support information aggregation, better understanding, and solutions in many places. 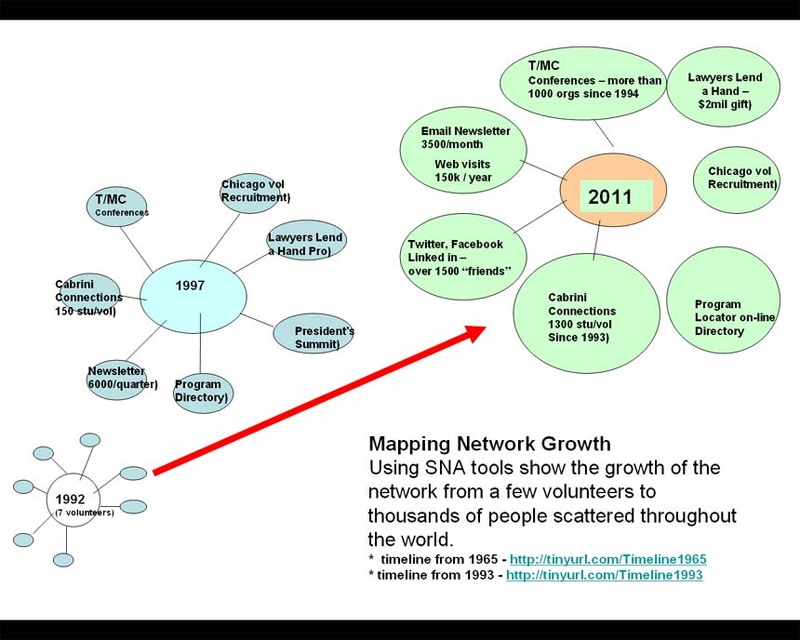 Such efforts should be supported by documentation systems where people show what they do daily to build the network (see OHATS introduction as example) and by network analysis maps that show the growth and diversity of the network and connect members to each other. 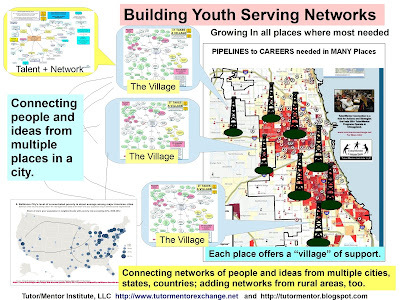 View this network analysis report showing work done by a May-June 2012 intern. I encourage you to view this video where Jeff Edmonds, CEO of the STRIVE project in Cincinnati talks about how data can be used to support "every child, every step of the way, from cradle to career". 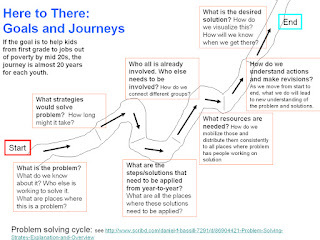 I've been talking about supporting youth from "birth to work" for more than 18 years and have been using maps and graphics to illustrate these ideas. Yet while STRIVE has an annual budget of more than $1.5 million to do its work in Cincinnati, a much smaller urban area than Chicago, I've never had more than $150,000 to support the Tutor/Mentor Connection. I encourage you to read this Stanford Social Innovative Review article which describes the STRIVE partnership and shows its own funding challenges. 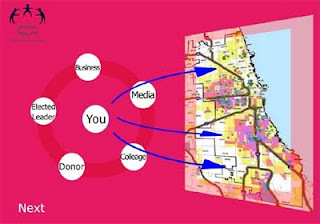 While I'd like to find a benefactor and partner to turn the Tutor/Mentor Institute, LLC into a Think Tank that could support collective efforts focused on mentoring kids to careers in every city in the country, I'd also like to find a way to become a consultant/adviser to any group who is already doing this....in Chicago....or in any other city. 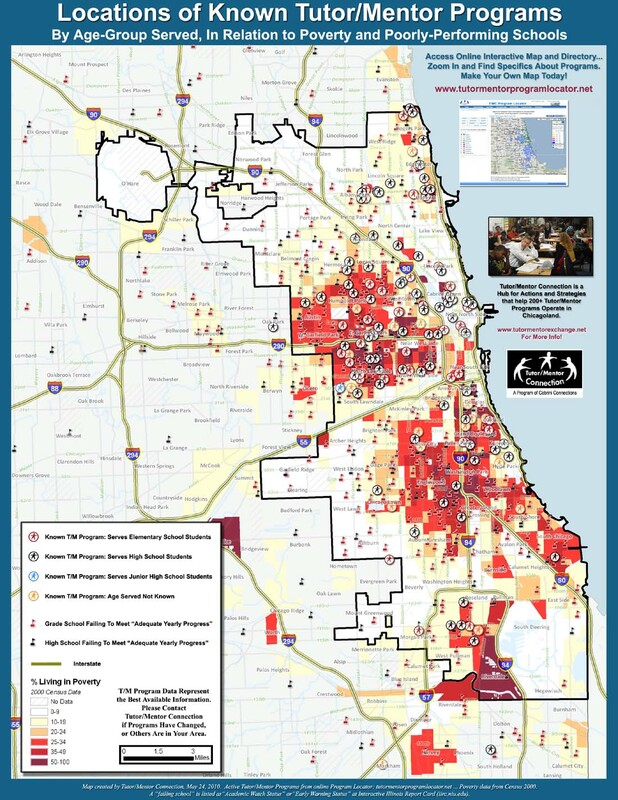 I've used maps to show where poor schools are located and where acts of violence take place in an effort to mobilize more people to support mentor-rich non-school tutor/mentor programs in these places. From time to time I point to research done by others that reinforce these points, as well as to news stories that bring attention, but not solutions. In the introduction the first paragraph says "Where one lives may be the most important factor in determining health outcomes. And because of our history of racial oppression and the legacy of that oppression in residential patterns today, the intersection of place and race in the persistence of health disparities looms large." 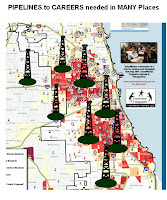 The Executive Summary provides this motivation for citizens throughout the Chicago region to be concerned and involved. "Clearly, there is a strong moral imperative to enact policies to redress the inequities of the past, as well as current inequities, in ways that will improve health for all. But, there also is a powerful economic incentive. A study released by the Joint Center for Political and Economic Studies in 2009 found that direct medical costs associated with health inequities among African Americans, Hispanics, and Asian Americans approached $230 billion between 2003 and 2006. When indirect costs, such as lowered productivity and lost tax revenue resulting from illness and premature death, were included, the total cost of health inequities exceeded $1.24 trillion.7 Thus, for both moral and economic reasons, we must address health inequities and their root causes now." In today's Chicago Tribune is an article titled "Violence takes a toll on child's play." which also draws attention to "place" and the challenges that face parents, schools and children in these neighborhoods. I hope that one of these articles will make some of your concerned enough to launch a "learning group" in your company, family, faith group, alumni group, etc. Only when more people are engaged with the information and actively involved in building youth support programs in all of the poverty neighborhoods will we ever have enough people involved to change these conditions. If you do have a group of people focusing on this issue why not participate in the November 19 Tutor/Mentor Leadership and Networking Conference where you can share your own understanding and help more people get involved? Follow the tags below to see more articles related to this topic. 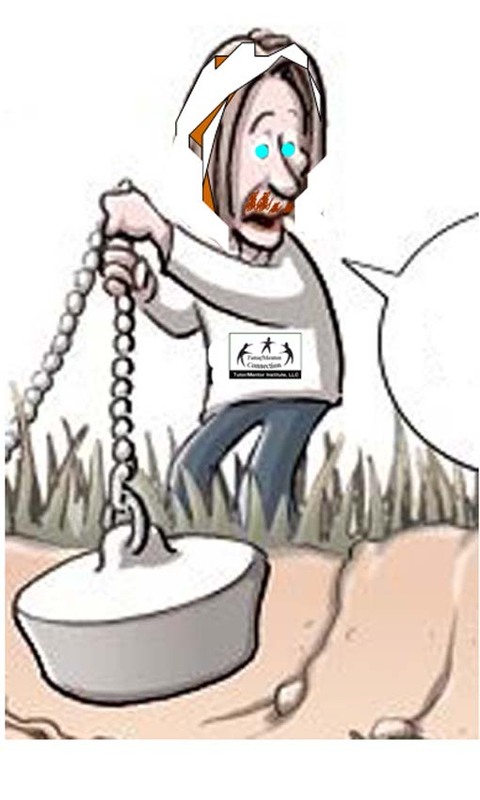 Can't Drain the Swamp? Up to your Neck in Alligators? 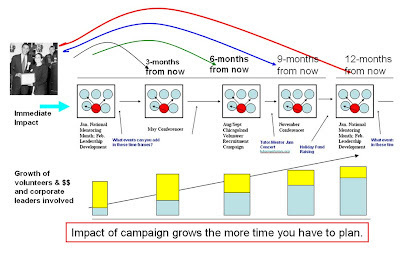 If you skim through articles I've written since 2005 you'll see a growing use of visualizations to communicate ideas. Many of these start as scratches on a tablet as an idea comes to me, then are converted to power point. I've been lucky to have interns from IIT and other universities work with me for a few weeks every year who have used their own talent to convert some of my essays into new graphics. This page shows work that has been done. However, these interns are only with me a few weeks in the winter and spring. I come up with ideas all the time but don't have the talent to communicate these as effectively as I'd like. Here's an example. I've used maps to show where poverty is concentrated in Chicago and to show where existing tutor/mentor programs are located. You can see many like this in this map gallery. In addition, I use maps in many of my blog articles I've written about how poverty affects health, student aspirations, education performance, etc. 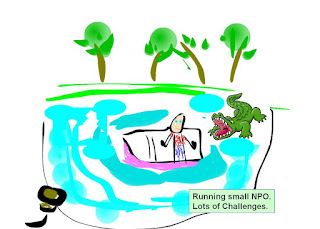 In other articles and in this section of my library I show challenges that non profit tutor/mentor programs face in finding the talent and operating resources to build and sustain constantly improving long-term programs. Since I started the Tutor/Mentor Connection in 1993 my goal has been to help all of the non-school tutor/mentor programs in the region get the operating resources they need while helping new programs focus in areas where more are needed. While many of my peers have said "I like what you do." most have said "When I'm able to get my own program stabilized, I'll help you do this". I've always said to myself, "They will never help because by themselves they can't solve the funding and resource flow problems facing non profit organizations." So this week I was thinking about this and I thought of the saying "can't drain the swamp because I'm up to my neck in alligators". How could I visualize this? Well I started scratching out some ideas. I used a free drawing application (here) to create these graphics. So here's the first image I thought of. I'm in a boat in the middle of a swamp. The boat is leaking water and I'm surrounded by alligators. 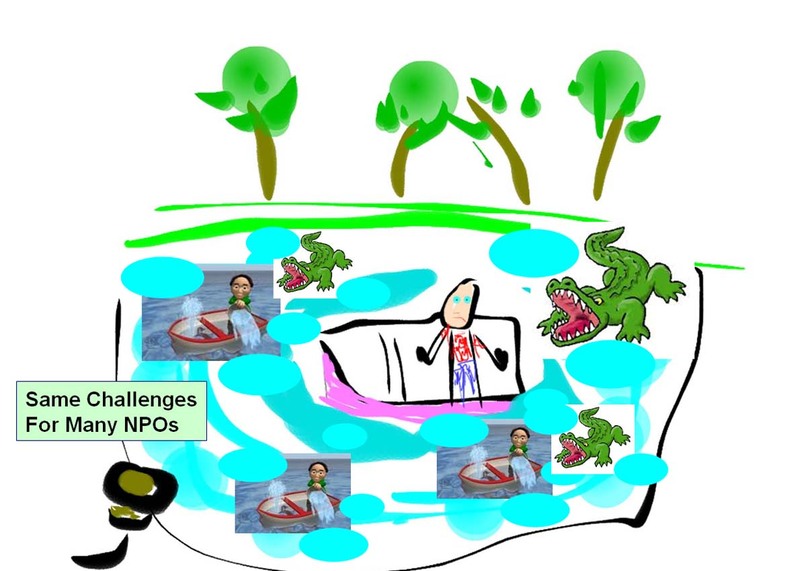 Through the actions of the Tutor/Mentor Connection I've been trying to "drain the swamp". This graphic illustrates this. 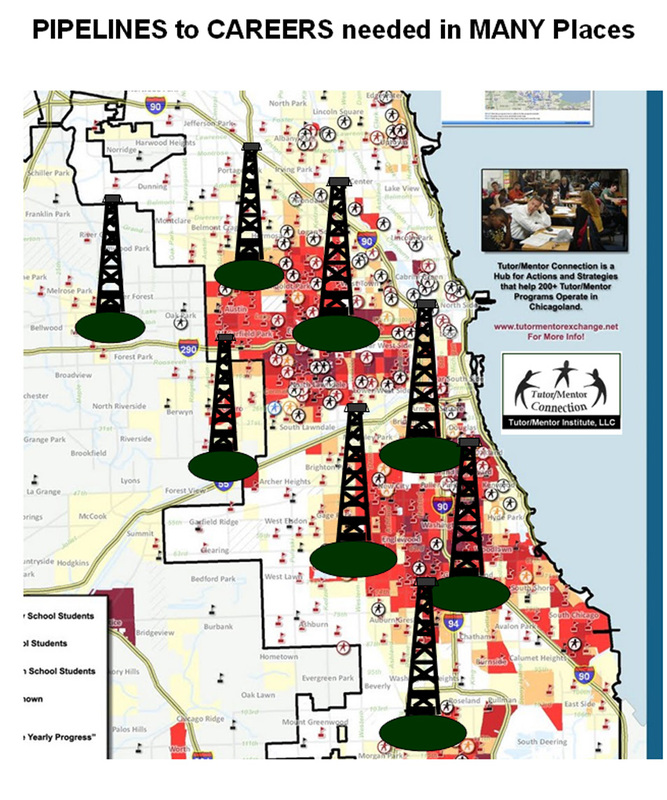 This next graphic shows how many of the 170-plus tutoring and/or mentoring programs in the Chicago region face the same challenges every day. 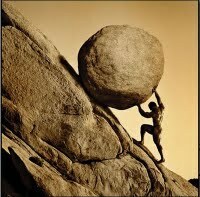 So what if many non profits were working together to overcome the challenges we each face. What if leaders in business, faith groups, politics, sports, entertainment, etc. were working with us? We could be building greater daily attention for ways to help build student aspirations and learning habits while also building support systems that expand the network of adults and learning opportunities available to kids in every high poverty neighborhood. Through the collective efforts of many people we could be helping more volunteers connect with kids in tutor/mentor programs as school starts each year. We could be encouraging more workplace donors to support these programs during workplace fund raising campaigns in the fall. We could be bringing more people together to share ideas and give recognition to programs in November. And we could be using this November attention to encourage more year-end donors to seek out tutor/mentor programs in different neighborhoods. So now that I've laid out my thinking. Who is willing to volunteer their talent to turn this into a new graphic, animation, video or some form of communication that will draw thousands of people to read it, reflect on what the meaning is, and find ways to support the growth of tutor/mentor programs this year in Chicago or any other city in the country? I've been coaching my interns in the Tutor/Mentor Connection forum. I encourage you to introduce yourself there if you'd like to offer your talent. Every day I spend time connecting with a wide range of people and ideas from around the world. As I find ideas that I think leaders can use to support "birth to work" activities in Chicago and other cities I add these to the Library on the Tutor/Mentor Connection web site. That way they are there for me to read in the future and also available to anyone who visits that site. Today I found a few interesting articles in my Facebook groups. Human Development Framework - this site includes a concept map which is "A visual representation of the roles of ICT in the Human Development process". Understanding Content Curation - This is a really significant article because it talks about the value of aggregating information and what makes this valuable. In one paragraph the writer says, "In considering the advantage of collecting vs. curating, it seems that collecting serves primarily the needs or interests of the collector. With curating, a larger goal is to benefit not only the collector, but other potential learners as well. It is meant to be shared. And, both the process and the product of curating help the curator as well as those who view the curated collection to understand and to learn." . Developing Future Workskills Through Content Curation - This site includes a concept map of skills needed and talks about "the role content curation can play for students in inspiring passion-based learning, moving towards personalized learning and of the many skills and habits of mind that students can develop through the process." These two articles pointed me to the link below. Future Work Skills 2020 - this article lists 10 skills that workers should have for jobs in the coming decades. I'd like to find someone who has developed a "test" that could measure how well students and adults are learning these skills and to show what percent of youth in each school are "meeting standards" for learning these. I think it would be far more valuable than testing reading, writing, math proficiency. I've written many articles on learning in past blog articles. I hope you'll budget some time to read and reflect on what I've added today.